Let’s build a radical, multi-racial, working-class feminist movement! As the sun rises on the third outpouring of women’s marches around the globe, optimism is in the air, with the realization that the time for change is now and we can make it happen! Controversies have shadowed march organizing in some U.S. cities this year. But a new and positive step is the feminist left contingents that were organized in several places to indict capitalism for the attacks raining down on women, immigrants, people of color, transgender and queer folks, Jews, Muslims, youth, unions and socialists. Forging unity. When women and low-paid workers take the lead – as 50,000 Bangladeshi textile workers and 30,000 Los Angeles teachers are doing right now – historic divisions begin to fall. Unity is possible when people realize that their common experience of living paycheck to paycheck means they also have a common enemy: the profit system, which steals the wealth created by the world’s workers and terrorizes its opponents. Winning justice for all women means prioritizing the leadership of those who have the least. This is especially true in the U.S. of working-class women of color, whose experiences of prejudice and poverty tend to make them the most militant in confronting the powers that be. Trouble at Women’s March, Inc. Over the last few months, leaders of the national Women’s March have gravely mishandled serious issues of anti-Semitism, transphobia, and racism. This has become a debacle of identity politics – an approach which tends to promote competition, rather than common cause, between people of different backgrounds. The conflicts have caused some cities to cancel marches and led to calls for key national organizers to step down. Opponents of women’s activism are taking advantage of the disarray to attack from the right. Conservatives and Zionists have slammed Arab American march leader Linda Sarsour with the false accusation of being anti-Semitic because of her support for Palestine and the Boycott Divestment and Sanctions campaign against Israel. Pro-police and racist forces have denounced the Women’s March for sending greetings to exiled Black revolutionary Assata Shakur. Undoubtedly, a mix of forces from the FBI to so-called men’s rights advocates are busy trying to prevent a multi-racial, grassroots feminist movement from consolidating and truly taking off. The core Women’s March organizers are heads of NGOs and businesswomen supportive of the Democratic Party, which upholds capitalism. Their class interests lead toward alliance with powerful funders and politicians rather than bold, system-shaking action. And it has been difficult for the movement to confront their liberal views and identity-focused politics because they are not democratically accountable. Luckily, however, feminism and the global women’s march movement are more than their leadership. Black and Jewish solidarity is possible. Quiet as it’s kept, Jews and Blacks have a long history of mutual support. Three Jews were part of John Brown’s 1859 raids against pro-slavery settlers in Kansas. In the 1940s, Blacks and Jews fought together to make permanent the Fair Employment Practices Act, which outlawed employment discrimination based on race, religion or national origin. Two-thirds of whites who participated in the 1964 Freedom Summer were Jewish, and some gave their lives alongside Black civil rights martyrs. Jewish radicals were key supporters of the Scottsboro Nine and other victims of racist frame-ups. At the same time, Black organizers have resisted pressure to break with Jewish allies because of real or alleged communist affiliations. Today, Blacks and Jews are both prime targets of inflammatory propaganda, assaults, and shootings by white nationalists and fascists. Muslims, trans people, queers, women, immigrants, unionists, leftists, and the homeless are also in the crosshairs. It’s more than time for us to join together to fight for our survival and freedom! Unite against misogynist extremists. With far-right organizing on the rise, no movement of oppressed people can afford to accommodate internal racism, sexism or other forms of bigotry. Differences inevitably arise because of each group’s diverse experiences. But conflicts have to be dealt with upfront with a desire for resolution, not a rush to judgment. An indispensable part of finding the way forward is the leadership of working-class women, especially women of color, who are motivated by a determination to transform society from bottom to top. An anti-capitalist approach is galvanizing people throughout the world. It’s time for the U.S. women’s movement to get radical! In place of unaccountable NGOs, it’s time to revive member-based organizations with clear programs, open decision-making and leadership training. 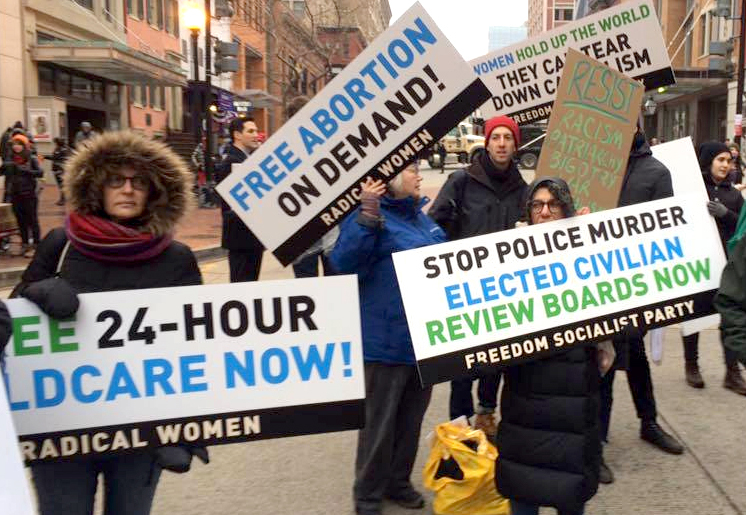 That’s what Radical Women and the Freedom Socialist Party – sister organizations based on socialist feminism – are all about. Let’s work together to build the democratic and inclusive feminist movement that the world so desperately needs! Download a copy of this leaflet by clicking here.